A PICTURE OF THE CATHOLIC JESUS! Can you tell where the Catholic Jesus is in these pictures? See that little white circle in the middle of the sunbursts? That is a cracker. 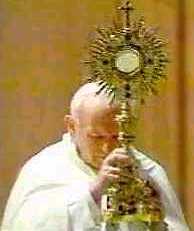 Catholics call it Jesus or the "holy" Eucharist. They eat their Jesus. But before they eat him, they have to bow down in front of this gold thing that holds their Jesus and worship him. The gold thing is called a monstrance. But before they bow down in front of the monstrance (graven image) with their Jesus (idol) in it, they like to parade him through the streets and "adore" him in their solemn processions. You see, their Jesus can't walk. He has to be borne about by men. THIS is the Catholic Jesus that we write about here at Jesus is Lord--he is plainly not the Jesus of the Bible. "Adoration of Christ in this Sacrament of love must also find expression in various forms of Eucharistic devotion: personal prayer before the Blessed Sacrament [the Eucharist], hours of adoration, periods of exposition - short, prolonged and annual (Forty Hours) - Eucharistic benediction, Eucharistic processions, Eucharistic Congresses." The mass is the center of Catholicism and the Eucharist (that little round wafer above) is the center of the mass. "...[E]ucharistic worship is the center and goal of all sacramental life." The Eucharist has been referred to as the Catholic "wafer god". I think that is an appropriate name for it. Without eating their Jesus, the Eucharist, Catholics believe they can't go to heaven. Their Jesus, the Eucharist, is also called "The Sacrifice" and "The Victim" (see above encyclical for examples). You see, they don't believe that the work of Jesus Christ was finished on the cross--He is supposed to be a perpetual victim always getting sacrificed over and over again. Dying over and over and over. That's why you continually see them with dead Jesus' on crosses in their churches and homes--just hanging there, dead. My Jesus is not the "Eternal Victim", He is the Eternal Lord of Lords and King of Kings! Jesus told me in His word that His ONE time sacrifice is finished, completed, over. The Lord Jesus Christ is back in heaven where He came from waiting on His enemies to be made His footstool, not hopping up to enter a piece of bread. The mythical Eucharist is just another man-made tradition. What else did Karol say? "The encouragement and deepening of the Eucharistic [cracker] worship are proofs of that authentic renewal...Jesus waits for us in this sacrament of love..."
Many Catholics say that I don't understand Catholicism BUT NOT ONE will deny that they consider that cracker Jesus! NOT ONE WILL DENY that they fall down in front of images like this as well as statues, relics, paintings, and other images. NOT ONE will say that the ONE TIME sacrifice of Jesus Christ is enough to save your soul. I have told no lies on the Catholic religion on this site and I have no misunderstanding. Just go to some of their websites--you'll see what I'm saying is true. Get into a conversation with one and ask them about these things--you'll see they're true. Compare their encyclicals, decretals, and catechism to the Bible and see if you don't find contradictory documents. You don't have to take my word for it. im-age (im'ij) n. an imitation or representation of a person or thing, drawn, painted, photographed, etc. ; esp., a statue; a sculpted figure used as an idol. The above passage says that God had forbidden the people to make a graven image. Where is this at in the Bible? Maybe Exodus 20:4-5? Thou shalt not make unto thee any graven image, or any likeness of any thing that is in heaven above, or that is in the earth beneath, or that is in the water under the earth. Thou shalt not bow down thyself to them, nor serve them: for I the LORD thy God am a jealous God, visiting the iniquity of the fathers upon the children unto the third and fourth generation of them that hate me. What you just read was the SECOND of the ten commandments. Is it any wonder why the Catholic religion deletes it? Is it not apparent to you? and that the God of the universe will enter it at the COMMAND of a priest. Blasphemy, idolatry, disrespect, and cannibalism supreme. Click here to see belief in the Eucharist in action.